A huge milestone for a great member! 1000 games! Jan Burke, one of the many long term, loyal, and wonderful friends we've been fortunate enough to have made through WAPL over the last 11+ years, has just last Thursday reached a great milestone for herself and our league. Just about everyone who has played at our northern venues, Free or Pro League, will know who Jan is, by sight if not name, but many will not know to what extent Jan has been a great supporter of WAPL over the last decade plus. 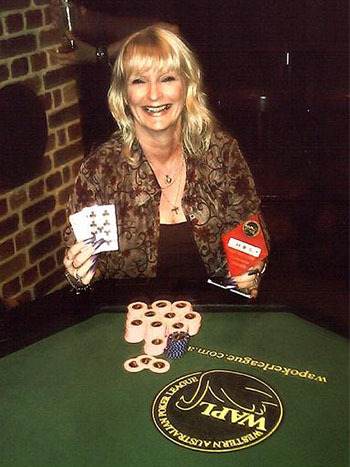 Jan has been the Permit Holder for our fundraising events at the Woodvale Tavern for almost as long as she's been playing poker with us, and as such, her dedication of her time, week in and week out, helps make it possible for every one of our Pro and Cash players to play poker with us. Jan has been a life member of WAPL for many years now, thanks to the phenomenal support, great energy and wonderful attitude she brings to every event, and is also a Free League Grand Final Champion! It was absolutely fitting, and a great occasion, to see Jan manage to WIN the tournament on Thursday for her 1000th! Here's a couple of shots of Jan, one from way back when, at her very first tournament win (which was at the Woodvale Tavern, no less! 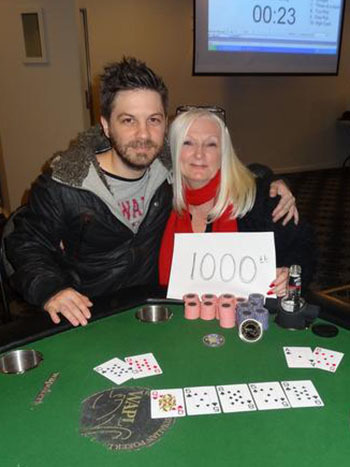 ), and her 1000th tournament win! Jan wins her 1000th Free League game, 6th July, 2017, with her son Jod!